Imtiaz Dharker - Poetry Live! 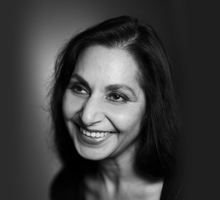 Imtiaz Dharker was born in Lahore, Pakistan, and then when she was less than a year old moved to Glasgow. She went to university in Glasgow and then moved to Bombay where she has since been based – although she does spend many months a year in London. It is from this life of transitions that she draws many of her themes: childhood, exile, journeying, home and religious strife. In Purdah (published in 1989 and forming half of her Bloodaxe collection Postcards from god 1997) she is a traveller between cultures. In Postcards from god she imagines an anguished god surveying a world stricken by fundamentalism. Her more recent collections are I speak for the devil (2001), The terrorist at my table (2006), and Leaving Fingerprints (2009). Not only does she write poetry, she is also an artist. All the ink drawings in the poetry collections are reproductions of her works, although originally they are much larger. Imtiaz Dharker imagines her books as sequences of both poems and drawings. As if this isn’t enough she is also a well-known documentary film maker in India, producing, with her team, about ten films a year. ‘The image of purdah for me was on the dangerous edge of being almost seductive: the hidden body, the highlighted eyes, the suggestion of forbidden places. But of course it is also being used to bring women to heel in the name of religion. God has been hijacked to justify all kinds of acts of violence. The speaker in the first Postcards from god poem is a somewhat bewildered god. This god looks out at a fractured landscape: Bombay, where I live, is a city of grandiose dreams and structures held together with sellotape and string (‘Living Space’). In the face of impending collapse, the eggs in the wire basket seemed impossibly optimistic. Religion-based violence suddenly forces people who had not thought of themselves as religious to take a stand, define themselves in terms of the religion they were born into. There is a moment when the neighbours’ children become the sinister enemy, and the name of god takes on a dangerous sound. I enjoy the benefits of being an outcast in most societies I know. I don’t want to have to define myself in terms of location or religion. In a world that seems to be splitting itself into narrower national and religious groups, sects, castes, subcastes, we can go on excluding others until we come down to a minority of one’.